BLT with cheese | suppertime! Ok – not a recipe, but this was so tasty I had to share. A BLT with melted cheese. Slice crusty bread in half, spread with a little mayo. Add ketchup & American mustard to one side. Slice sweet small tomatoes on one side & cover with black pepper. When you flip the bacon over, add a thin slice of your cheese of choice to the cooked side & let it melt in the frying pan. When the cheese is gloopy, add the bacon to the bread and stuff in some leaves – rocket would be good but I used lettuce & baby spinach. Assemble and eat. The weather justifies it. 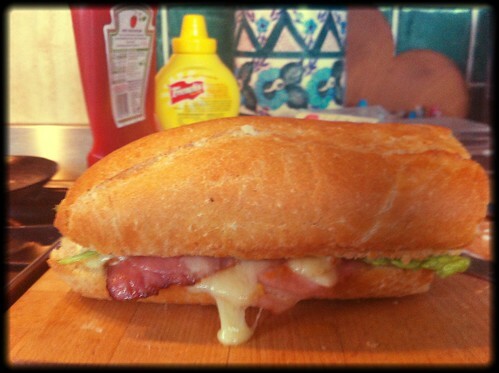 This entry was posted in bacon, bread, breakfast, meat, pork and tagged bacon, BLT, brunch, sandwich. Bookmark the permalink.